Every network provider in a bid to lure in more customers and also keep the existing ones are introducing several packages lately which are super awesome. This time it's Etisalat, and they have just introduced a new package which is called the Real Bonus. 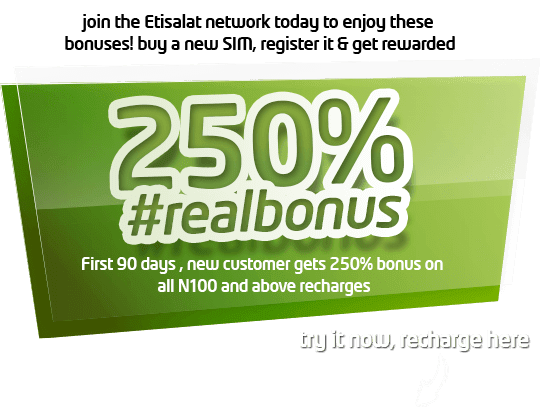 With the new Etisalat Real Bonus, you get 250% bonus on every recharge above N100 and also 150% bonus for every recharge below N100 and it's valid for 7days. Aside the fact that you can call any network of your choice with the bonus airtime, you can also browse and send SMS with it. Below are some of the things you should know about this new package. Features Of The Etisalat Real Bonus. ==> The Bonus airtime is split into two. while one part can be used to call only Etisalat network, the other half cam be used to call only etisalat network. ==> The validity of the bonus airtime is 7days. ==> You can use your bonus airtime to either call etisalat network, call other network, send text messages or even to browse. If you have any question feel free to drop it in the comment box below.